Just like Samgyetang, Bibimbap is one of the signature must-try dishes which is extremely popular for anyone venturing into Korean cuisine. While the former draws attention through the use of ginseng which is known for its medicinal properties as well as mythical qualities it is said to have, bibimbap attracts the crowd by its dramatic display of colours and appeal. With an assortment of stir fried and fresh vegetables being spread around a bowl of rice, the multitude of components in contrasting hues make it all the more appetising. 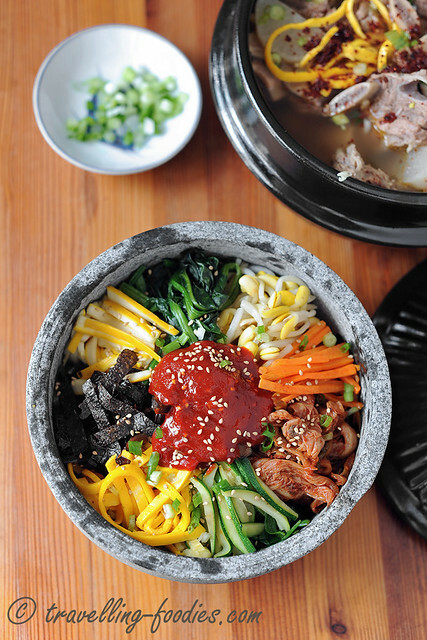 When carefully chosen, bibimbap can be a really healthy and well-balanced one-bowl meal which is not only highly played on the visuals, but the nutritional values as well. Yes the sheer number of components may make it kind of intimidating to prepare all at once. The gathering of ingredients may prove to be quite a feat for some people. However, the versatility of the choice of ingredients also lends the dish high levels of flexibility, allow one to almost freely choose whichever ingredients one favours and prefers. 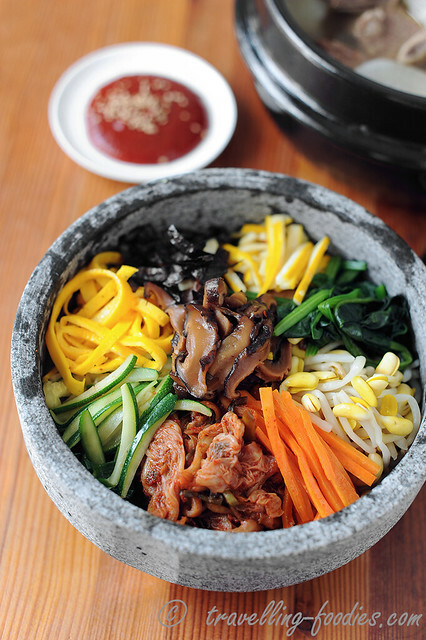 A more traditional bibimbap follows the traditional Chinese medicinal doctrine of the “five colours” (五色）. This is hardly surprising as throughout history, Koreans as maintained close interaction with the Chinese, sometimes proximal ties, sometimes in war and conflict. But the influence of the Chinese ways of life bears strong influence over the Koreans in countless means and one of which is Chinese medicine. So in the preparation of the bibimbap, I tried to adhere to the incorporation of the five elements with foods representing the five colours, i.e. yellow zucchini and egg yolk omelette (gyeranjidan) for yellow, spinach and green zucchini for green,white rice and soya bean sprouts (kongnamul) for white, toasted dried seaweed and shiitake mushroom for black and finally a good dollop of gochujang which is essentially seasoned korean chili pepper paste for red! The bibimbap I made is largely vegetarian. 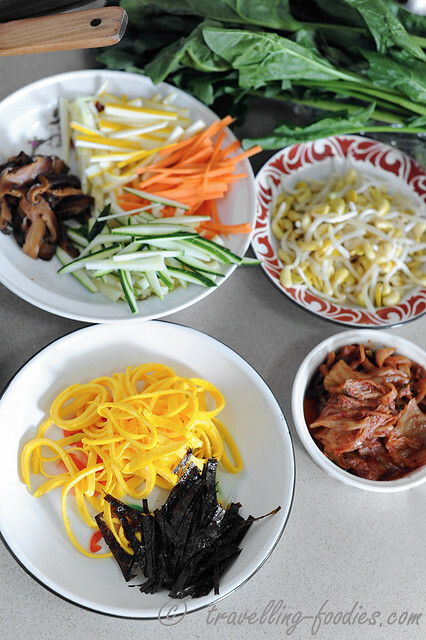 Apart from the ingredients I’d incorporated, some other ingredients used in bibimbap also include fresh cucumber, fresh lettuce, fern brake (Gosari/Kosari), bell pepper flower, raw egg yolk or sunnyside up, as well we meats like beef, chicken or even seafood. The possibilities are endless! Cook rice as per instructions of rice cooker, usually water and rice in the ratio of 1:1. In a small pot of boiling water, add a tsp of cooking oil, pinch of salt and blanch soya bean sprouts for 2-3 min until just soften. Drain well and set aside. To the same pot of boiling water, blanch chopped spinach for 1-2 min. Drain well and set aside. Reserve blanching water for later use. To the same pot, add shiitake mushrooms, 1 tbsp dark soya sauce, 1 tbsp of brown sugar, pinch of salt and pepper, 1 tsp of sesame oil. Stir fry the mushrooms lightly for 30s and add water until the mushrooms are JUST submerged. Braise the mushrooms for about 20-30 min. Meanwhile, prepare other ingredients. Heat a non-stick frying pan at medium high and add 1/2 tbsp of cooking oil. Pan fry juilenned carrots for 30 s and add 1 tbsp of blanching water. Stir fry for another 30s。 Dish and set aside. Repeat the process for yellow zucchini. Add chopped matured kimchi and panfry for 30 s. Dish and set aside. Omit the frying process if fresh kimchi is used. 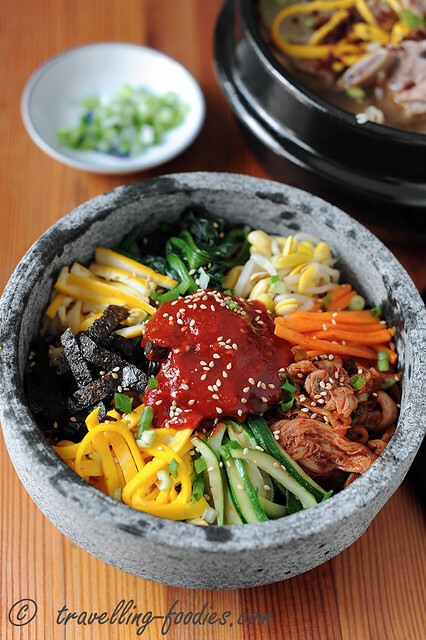 To prepare bibimbap sauce, simply combine all the ingredients in a small mixing bowl. Taste and adjust the flavours accordingly to personal liking. To assemble, place one portion of cooked white rice in a large serving bowl. Place a portion of braised mushrooms in the middle and arrange the cooked carrots, green zucchini, yellow zucchini, blanched soya bean sprouts, blanched spinach, gyeranjidan, kimchi around it. Place toasted seaweed strips last and just before serving as they will wilt rapidly upon in contact with heat and moisture. Spoon a generous dollop of bibimbap sauce over the top of the mushrooms and sprinkle more toasted white sesame seeds and chopped spring onions. Serve immediately, with other popular Korean side dishes or clear soups like Galbitang or Samgeytang! This entry was posted on April 30, 2014 by Alan (travellingfoodies). It was filed under Food, Simple Eats and was tagged with Bibimbap, carrot, egg yolk omelet, 비빔밥, gochujang sauce, gyeranjidan, hansik, kimchi, korean, sea weed, soya bean sprouts, spinach, zucchini.